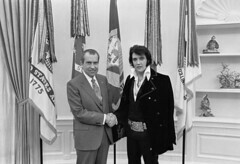 Richard M. Nixon and Elvis Presley at the White House — Lindzsays! Welcome to a new world. A world where I blog on a regular basis. I feel like I spent much of the beginning of this blog-life in doubt about what the blog could do for me and what I could do for the blog. Well, if this photo is any representation of me "making nice" with my blog, then I think this is the start of something very beautiful. And very weird.